Farro, Triticum dicoccum, monococcum or spelta, depending on the size of the grain, is an ancient grain that grows in the central and northern Italy, like Umbria, and Tuscany. 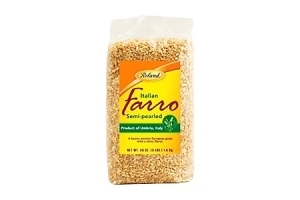 Our Farro is a pearled variety, the Italian would say perlato; the bran has been removed, allowing for shorter cooking times. It has a firm, chewy texture. Cleaned and pearl shape. Farro is popular in gourmet restaurants, vegetarian and Italian cuisine. Cook Farro in boiling water until medium tender. Drain. Heat oil in saucepan, add onion, carrot, celery. Season with salt, pepper. Add meat, brown for 2 minutes. Add wine, reduce. Add tomato sauce, one cup of stock. Add cooked Farro, simmer approximately 20 minutes or until it has reached the desired doneness.